Kudos: the act of recognising and acknowledging accomplishments. Giving credit where it’s due, including to yourself. For Kudos, the Melbourne-based, Sunshine Coast-born spoken word artist/rapper whose incendiary debut EP Give we’re proud to premiere today, it’s more than that – it’s an ethos that he weaves into his music, the start of a movement. 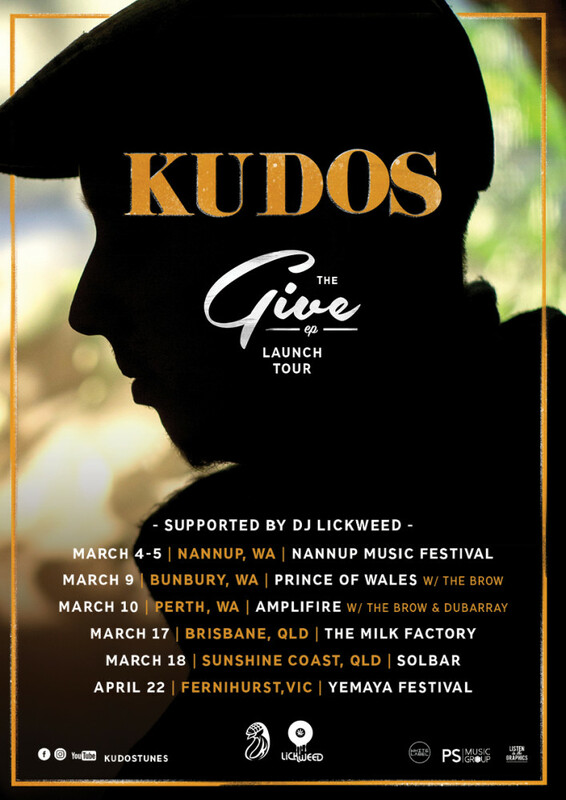 But as natural as this ethos might be to Kudos now, the Give EP was, as he puts it “a real journey.” Yuri Tobler‘s quirky, layered production provides a fresh backdrop for Kudos’ lyrics, touching on everything from sexuality to social expectations. Written during his transition from his small hometown on Queensland’s Sunshine Coast to Melbourne, that bustling city full of culture, coffee and all-black wardrobes, Give unpacks issues of self-doubt and insecurity within a framework of, ultimately, affording yourself the kudos you deserve. And deserve it he does. 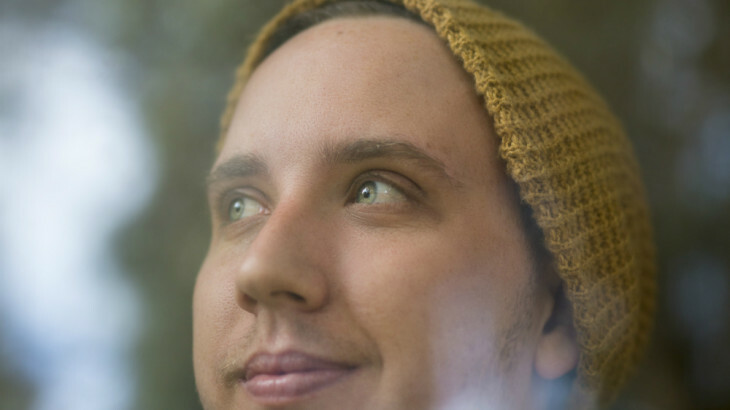 In the few short months since releasing his debut single Plucker and follow-up Don’t Love ft Georgia Rose last year, Kudos has drawn praise from national and international outlets, embarked on his own headline tour, and become a boutique festival mainstay with slots at Woodford Folk Festival, Jungle Love Festival, and Rainbow Serpent Festival all under his belt. He’s also supported the likes of Atmosphere and Mantra, in case all that wasn’t enough. Let Kudos take you through Give track by track below. The EP, and its title track single, officially drop on Saturday 4 February, followed by a six-date launch tour. It’s a motivating, spirited debut with the power to make you feel like whatever obstacle you might face can be easily defeated. You can pre-order it on iTunes here. I wrote Give at a time when I wasn’t feeling very confident in my future. The entire song is really just a manifestation of the advice I needed to hear at the time. I hope it helps others to hear it as much as it helped me to write it. Bubbles is a string of fictional tales I wrote about different dreams. The chorus literally came to me one day while I was day dreaming at the bottom of my pool. Scott seemed to be the obvious choice for a feature on this track. He wrote his verse in the studio. it took him fifteen minutes. Dude is a gun. This is my personal favourite off the EP. I wrote it at a time when I was having a lot of trouble coming to grips with my sexuality. It’s strange to hear it back now – I’m in such a better place. As a positive note, it stands as a great milestone to remind myself how far I’ve come. Plucker is all about balance. Recognising your own pain as being valid, even while at the same time recognising the trials of others in order to appreciate the positive things you do have. This is for the all the emcees who are trying to break through and do their own thing out there. For everyone who gets through the day by stealing moments standing in their bedroom rapping straight fire at the wall in between shifts at work. It’s a message for them – to stay motivated. The start of this song was inspired by a dancer I saw performing with Sunmonx when I first moved to Melbourne. Through a whole heap of coincidence I was able to meet Austero (Sunmonx) and he put me in contact with said dancer, who I eventually sent the song to. This song is about my fears of leaving my hometown and eventually breaking through that fear and taking the leap. I hope it inspires others to take whatever leap they need to as well.